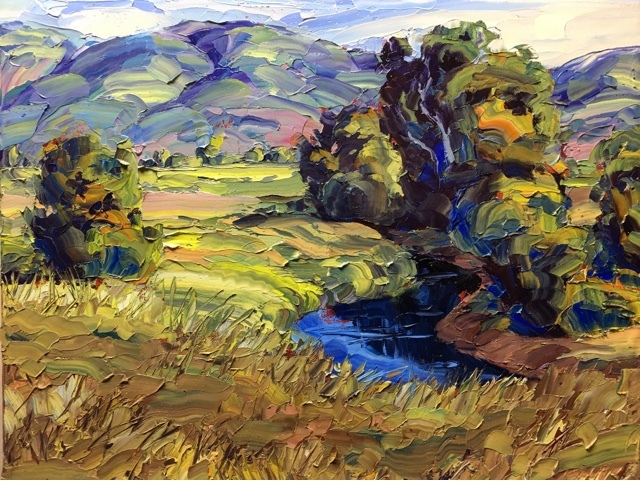 –I recently switched over to using palette knives for the entirety of my painting process. I cross-examined my motives, as I can embrace ideas for the wrong reasons at times (like laziness). But in this case, I think using palette knives exclusively makes sense, and I will definitely be open to using brushes in the future if my experiment with palette knives doesn't prove satisfying. Using palette knives makes for quick cleanup. So far I've been able to replicate every stroke I make with brushes. Getting solvents out of the studio is also a huge bonus. I use a wide range of knives, but several have proven to be favorites, especially when painting a medium size canvas (although I use these on the details of larger canvases as well). The first is a small blunt-nosed knife that is perfect for quickly laying in broad detail. I prefer a similar shape for larger paintings (the large, blunt pie-shaped knife in this set). These knives are the workhorses of my current painting process. Some shapes, like really long, flexible, pie shaped knives I have yet to figure out what they are good for. In time I may figure out what to do with them (leave a comment if you know). One of my all-time favorites is a Gecko leaf shaped knife that is so versatile I find myself using it for huge passages of my paintings, large or small. I use the broad edge for laying in paint quickly, and the flared edges for adding small detail like fence posts and branches. The broad edge is great for blending patches of color together. I often load the knife with another knife (usually the small, blunt variety mentioned above). I hold the blunt knife in my left hand and swipe some multi-varied color onto it from the palette and apply the paint onto the Ginko leaf shaped knife in my right hand. It's an amazingly versatile tool, and by loading it, I can get a wide range of beautifully variegated color. I hope to do a video of this technique soon. I love getting your blog posts. You are so generous with your knowledge and techniques. 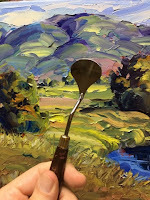 I look forward to your video on using your favorite palette knives. Thank you for your kind words, Martha. Keep painting. Love your art and determination. Thanks, Steve. I appreciate your enthusiasm. Your knife painting turned out great! Those pie-shaped knives are good for mixing paints and if they are long enough, you can get a nice straight line by turning the knife to its edge and load a bit of paint and apply to your painting. I too look forward to your palette knife vid! Thank you! Thanks, Teri. I will give that a try! Knives are an excellent tool to get one to think in broader shapes, which is almost always a good idea. Thanks for your comment. Since I was trained in Indian traditional paintings I ended up with stiff landscapes and that is when I decided on only knives to get the style looser. I look forward to the video, sure to learn something new from it! Thank you Brad ...I have just started to watch your you tube videos and have learned so much. I love your paintings! ! !